All checked. You designed, developed and refined your online course. People are streaming to your website. You’ve grown an impressive collection of leads. 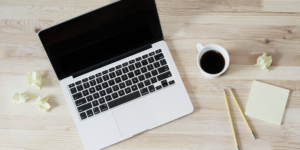 How do you turn those qualified leads into paying online course subscribers? Attracting eyeballs to your online course is one thing, but persuading people to enroll is another story. And in the end, it’s sales that matter. By using email automation, you can nurture leads to convert through your funnel. With more than 3.8 billion worldwide email users in 2018, and the projected growth to 4.5 billion by 2022, email is one of the most popular marketing strategies in place. It continues to remain extremely effective, as the preferred contact method for over 60% of consumers. That makes email automation a perfect tool for lead nurturing. 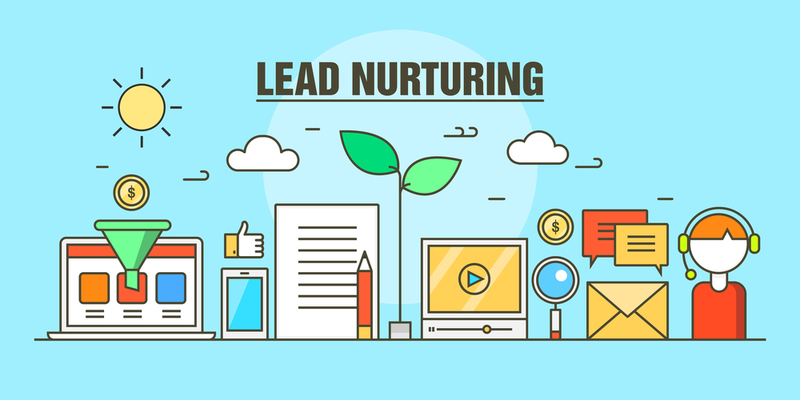 Lead nurturing is the process of establishing a relationship with your potential course subscribers even if they are not currently interested in purchase. The process, when strategically planned and developed with the right set of tools, can increase your online course sales by 20%, according to a 2017 study done by DemandGen. 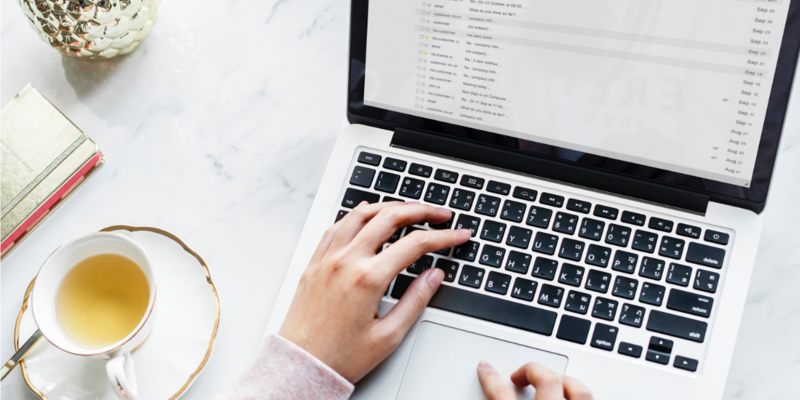 Implementing email automation campaigns as a part of lead nurturing helps engage your audience, establish trust in your business, and convince them to sign up for your courses. However, random manually-sent emails won’t bring the desired results. Creation and distribution of these can get very labor-intensive. That’s where email automation comes to play, as it significantly reduces the effort required to boost your sales. Automated lead nurturing refers to the process of sending a series of emails based on the recipient’s actions. The term ‘automated’ may seem dreary and impersonal, but it’s quite the opposite. Thanks to the detailed information collected by email marketing software, you can tailor your message to precisely match your recipients’ expectations, and provide them with exactly what they need at the right time. What’s more, you can easily tie your email automation marketing with an all-in-one online course platform, making the entire lead nurturing cycle less laborious and more productive. What’s your goal? To sell more courses. You can achieve that by reaching high conversion rates from a targeted, personalized email campaign directed at well-researched, segmented leads. In our case, the conversion rate is the percentage of people who receive your email and act on it by subscribing to your paid courses. 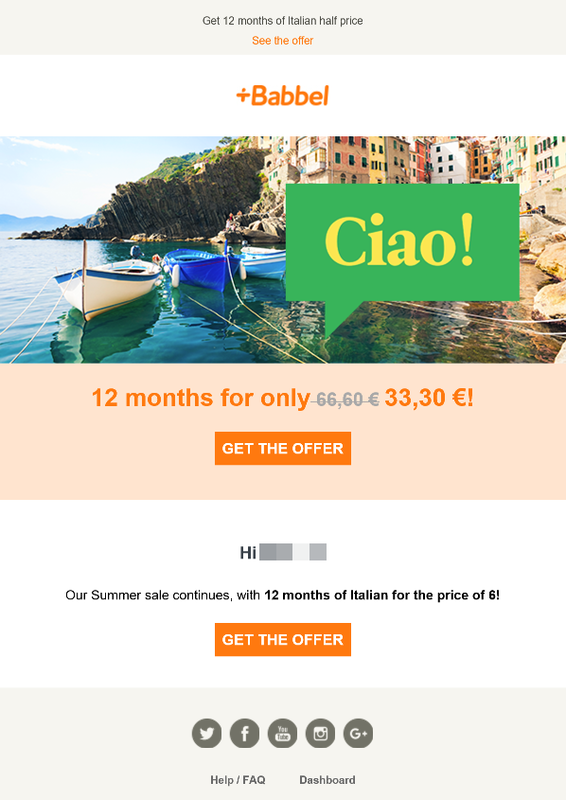 Tactics used to make automated, one-to-many emails seem like tailored one-to-one interaction. The more detailed the knowledge about your leads, the higher the level of personalization. The more personalized your emails, the higher the conversion rate. Segmentation refers to dividing your leads into groups based on a set of commonalities. We’ll focus on two complementary types of segmentation: demographic and behavioral. Demographic segmentation identifies our target buyers based on variables such as age, gender, location, ethnicity, income, or education. Marketers use it to create the so-called buyer personas – the semi-fictional representations of your ideal customers. 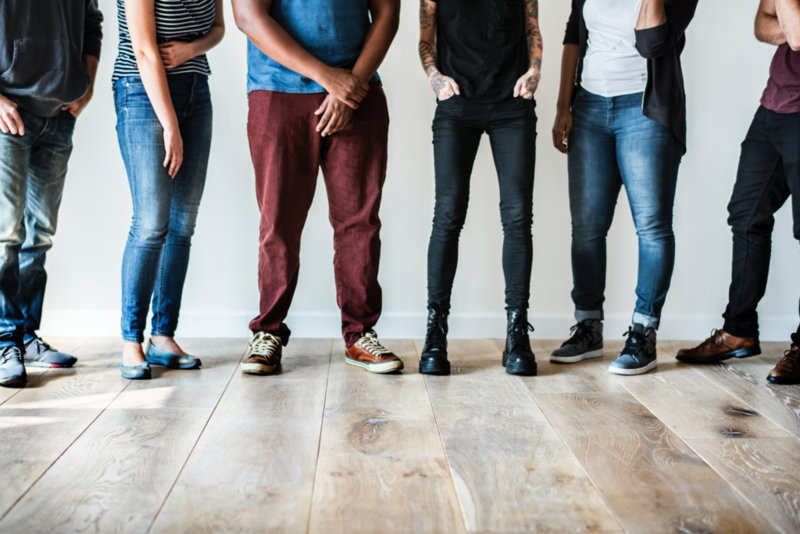 Creating buyer personas helps you better understand your target buyers, their needs, and the motivation behind their purchase decisions, thus helping you improve and adapt your courses to match their expectations. Behavioral segmentation groups customers according to patterns of behavior. This looks at whether a given person is ready to purchase when they buy, or what motivates their buying decision. Thanks to this knowledge, you can hit the ‘Send’ button (or rather let your email automation system do it for you) exactly when your potential customer expects it. There are hundreds of attributes you may use to segment your potential buyers. Not all of them make sense. To help you understand how to create valuable segmentation lists, we will run through several real-life examples of behavioral segmentation. You can copy and adapt them to optimize your email marketing efforts right now! A caveat: This list is not mutually exclusive, nor exhaustive. First-timers. Visitors who have never signed up for your course. Let’s say that you sell paid-only courses, no freebies. You notice some first-timers on your website who leave without a purchase. To capture these potential buyers, you may offer a free trial for this group only. One-time buyers. People who have already tried out one of your courses. Try to analyze why they are not eager for more. Maybe you ran an attractive discount, which motivated them to buy, and now the prices have gone up. Or they were not satisfied with your course? Maybe they simply got interrupted at purchase (what’s known as cart abandonment). Understanding that motivation will help you design a campaign that will lead them to another purchase. Repeated buyers. You can see that these leads are satisfied with your online courses, but you think you still could drive more sales and turn them into loyal subscribers. It’s crucial to analyze their buying pattern and enhance commitment to your courses. Some tactics to achieve that include sending abandonment cart emails, running a loyalty campaign, providing exclusive discounts, or boosting your sales through upsell and cross-sell. Loyal subscribers. Reward your brand advocates for engaging in behaviors that help grow your business. You may create an ambassador program, send exclusive content (e.g., additional materials for your online course), or provide these buyers with early access to your incoming courses. Price-conscious newcomers. These are customers who would like to purchase but expect to pay less. Attract them with a free trial, and encourage purchase by offering discount coupons, creating holiday sales campaigns, or providing discounts for the recommendation. Collateral passer-byes. Those leads come to your website via a related purchase or download (e.g., e-book, webinar, trial). 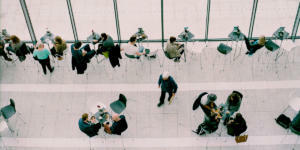 You want to establish their trust in your business, so think about sharing further complimentary material, offering them a free course, or extending an exclusive offer to convince them to buy. Partner consumers. You run a promotion with another company. For instance, if you teach photography, a camera manufacturer may have included your quote in their brochure. Now you’re reaching out to their audience. These potential customers are already involved in the subject of your course. Leverage that interest, e.g., by creating more valuable content on the topic and sharing it with them. Referral visitors. Word of mouth is a compelling sales tool. There’s a good chance that those visitors are already on your side. Now they need a minor incentive to buy. Run an information campaign, share exclusive content or a give them a sneak peek of an incoming course. Add a few words of a testimonial or 5-star rating of your class. You already know that these potential buyers value other people’s opinions. When you start your business, you may be able to handle your email list on your own, using an Excel spreadsheet or other old-school tactics. As you grow your courses, things will quickly gain pace. Email marketing automation software will take the burden of manual tasks off your shoulders, allowing you more time to craft high-quality online learning experiences. One of the most popular marketing platforms out there is HubSpot. In this example, we are going to show you how to leverage behavioral segmentation by using Hubspot in conjunction with Thinkific to turn a lead who has never purchased your product into a course buyer. Let’s roll! Imagine you’re currently running a large, multi-unit paid course in social media marketing. 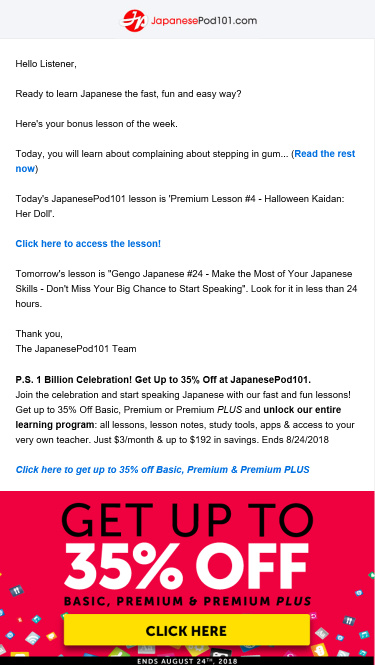 To attract more students, you’ve launched part 1 of 10 for free. Learners interested in continuing must subscribe for paid lessons. Ana is an aspiring marketer from Seattle, and she has enrolled in the free run. Based on the data that she has provided at subscription, you have her name, email address, interest, and location (the demographics). You also know that she’s a first-time subscriber and she will be looking to try out your course. Now it’s time to act. 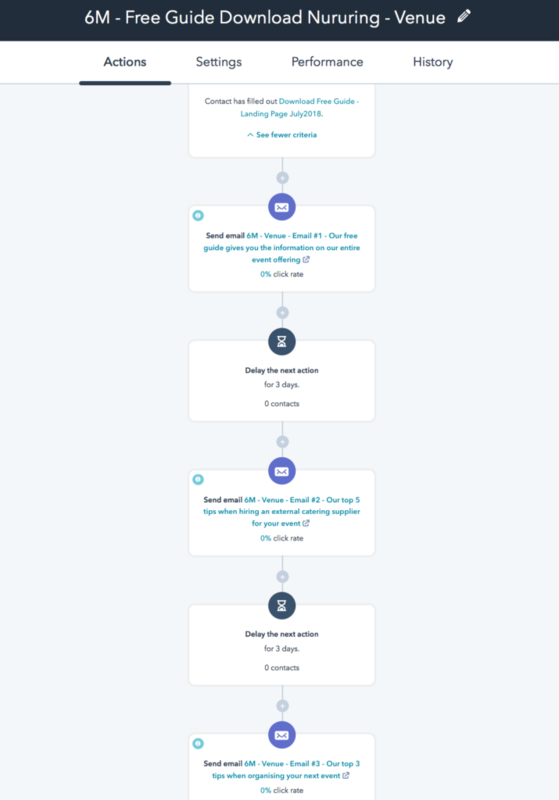 Right before the end of the free lesson, you’ll want to launch an automated email series. Your goal is to encourage Ana to stay with you and turn her into a paying customer. Ana will receive a series of emails on a regular basis, providing her with information about the content of each lesson, one lesson per email, and the benefits of the course. Each email in the series will contain a Call to Action button (or a CTA) to sign up. One email every 4-7 days. Also, send one additional email for every email that goes unopened, every email that is opened but not clicked on, and every email that gets a click, sent in-between these days. If Ana doesn’t open your email within 24-48 hours, send another with a different title, but without changing anything in the body. If she opens an email without clicking any links, change the copy and the CTA and send again after 24-48 hours. If she clicks on a link, wait for 24-48 hours and send another email related to your course, but presenting more benefits or a coupon code for a limited time discount, as she expressed interest in your offer. 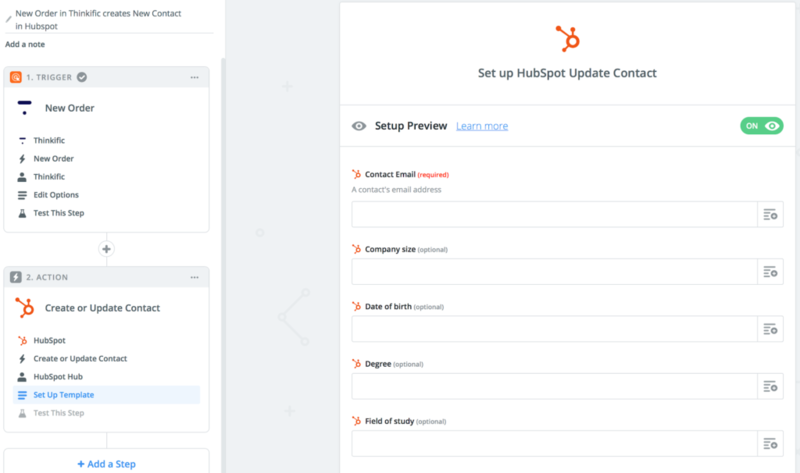 Currently, the integration between HubSpot (or another marketing automation software) is possible via Zapier. The exchange of information between the apps is bi-directional. To drive traffic from your website to Thinkific, create a dedicated landing page in Hubspot with access to your free Thinkific course. Once Ana submits the form on the landing page, the integration will enroll her into the course on Thinkific and send a confirmation email. This activity already provides HubSpot with a collection of critical data (Ana’s interests based on the course title and the landing page they came from, the course title, and Ana’s contact data such as name, phone, email, and date of submission). You can freely customize the form options to obtain more detailed information. Setting off the lead nurturing campaign for Thinkific is similar to starting any other campaign via HubSpot landing pages. In Workflows, choose the landing page that converted the visitor into a contact and set up a sequence of emails to trigger. To drive a lead nurturing campaign from Thinkific to HubSpot, launch your free course in Thinkific. Once Ana signs up, her contact details are sent to HubSpot with all her related attributes. Mandatory information includes an email address and the course title. To send that information, create a custom property in HubSpot that can be populated with the course title (e.g., Free Thinkific Course Enrolled). Additionally, you can send contact data such as first and last name, phone number and others. 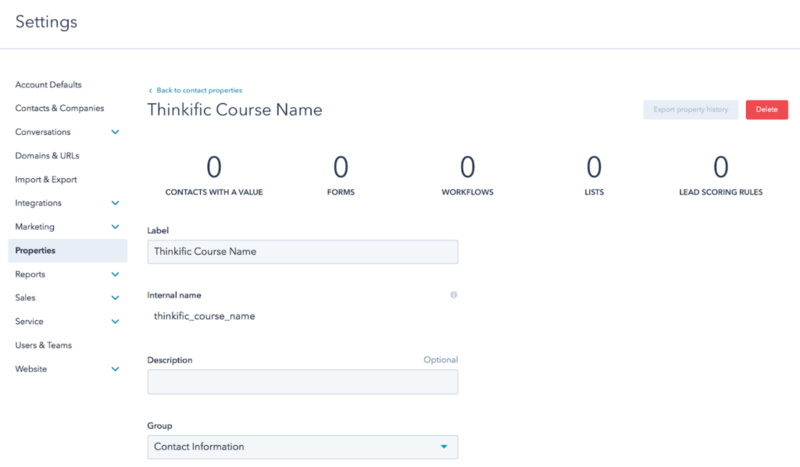 Once this data lands in Hubspot, you set up the workflow criteria to check the property with the course title (e.g., Free Thinkific Course Enrolled) and send a sequence of emails. 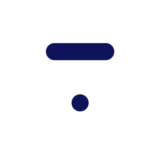 Sending data from HubSpot to Thinkific gives you more freedom as you have greater control over HubSpot. In the landing page form, you could ask subscribers if they bought a course for themselves or another person in their company. This way, you can adjust the email messaging accordingly. The information about the leads obtained from Thinkific won’t be as detailed. To stop sending encouraging emails when Ana purchases the course, you first need to pass that information to HubSpot. Set up a Zap that will send the information to HubSpot whenever an order on this course is traced by Thinkific. Create a new property (e.g., Paid Thinkific Course Enrolled) that will be populated once the event occurs. 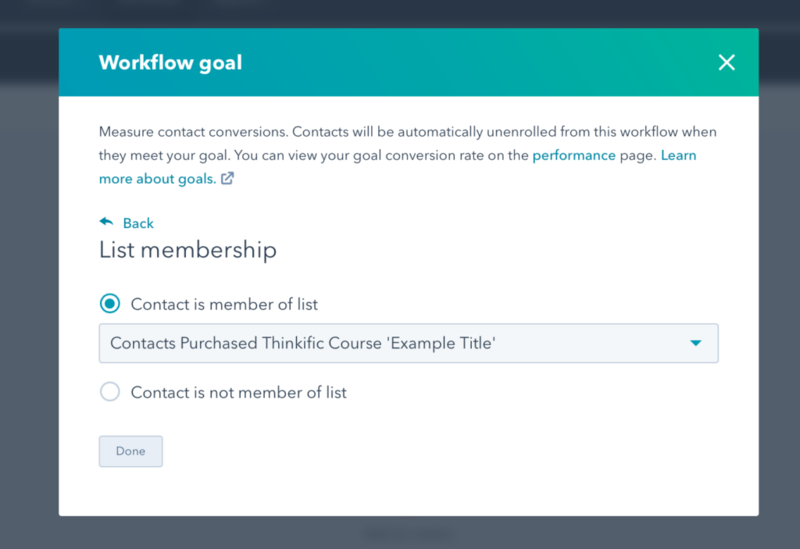 Afterward, in HubSpot, create a list of all the contacts who purchased this course, and set it as a goal in the Workflow section. Hubspot will automatically exclude these contacts from receiving emails. In the performance tab, you will see your lead nurturing campaign performance. Here’s an example sequence of emails (the first few) that you may create to encourage Ana (and other first-timers) to buy your course. Send this when Ana subscribes to your free course. This is one of the most critical emails you’re ever going to send to your subscribers. After all, you only get one chance to make a perfect first impression. The aim is to create a friendly, welcoming atmosphere, and invite your audience to engage with your business in the future. Make sure the tone of voice reflects the personality of your brand. Include a discernible, compelling Call to Action linking to your courses. Explain the unique value of your offer. Send this email before the course starts or shortly after the introductory email. Present lesson highlights and include relevant links. Remember to stress the values of your course for the learner. Don’t forget about the encouraging, friendly tone of voice. Add information about the paid products (in our case, the next lesson). The content of this email will be similar to the first one, as this is a series. You’ll also want to outline the lesson and encourage the learner to join. However, because this time you’re selling a paid product, the encouragement to join must be much stronger. Use indisputable arguments! If Ana doesn’t open your invitation to lesson 2, send another email like the one before. Create a new title, but don’t change anything in the body. Change the copy and the CTA and send again after 24-48 hours. If Ana clicks a link in the last email, that means she’s almost ready to buy, but may need a little bit more of a push. Wait for 24-48 hours and send another email related to your course, but presenting more benefits or a coupon code for a limited time discount. 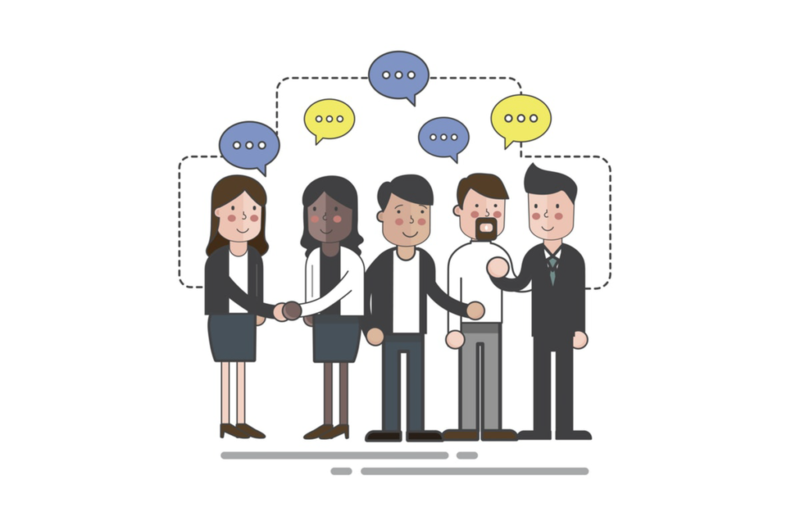 Lead nurturing helps you connect with your learners, keep them engaged, and gain their trust. Email automation allows you to reach your audience with the custom-made campaign at the right time, without the huge effort that manual emails require. Now it’s your turn to try out the powerful combination of your online course platform and email automation tool. It is a process that requires some time and engagement, but renders spectacular results and will help you boost your online course sales while you sleep. Matt Jachna is award-winning marketing strategist and founder at 6Minded inbound marketing agency which helps businesses around the world organize their content marketing campaigns.